CEREC® is a brand name for CEramic REConstruction.CEREC restorations are tooth-colored and blend in well with your natural teeth. CEREC allows the restoration of your teeth with the strong, long lasting tooth-colored materials that can allow your Dental One Dentist to save as much of your existing tooth structure as possible while using ceramic materials to reconstruct your tooth. The finished CEREC ceramics are bonded directly onto the existing tooth structure. And when bonding is complete, the new CEREC tooth becomes incredibly strong, due to the underlying existing tooth structure that was saved. How are CEREC restorations made? Dr. Kellen Smith will remove any old filling(s) and existing decay. The tooth is then scanned using a 3D video scanner and the exact dimensions are fed directly into the CEREC Omnicam computer. A live, three-dimensional picture of your tooth (and mouth) appears immediately on the computer monitor and you can watch the CEREC screen as your dentist captures the exact 3-Dimensional model of your mouth. Your Dentist will then use the 3-D software to reconstruct your tooth. By using CEREC’s CAD (Computer Aided Design) technology, the missing part of the tooth is designed to fit back in place, like the piece of a jigsaw puzzle. The result is a digitally customized replacement for your tooth. Next, CEREC sends all the specific information to a robotic milling machine for processing. A ceramic block that matches the exact shading of your own natural tooth color is selected and placed in the milling unit. Then a precise diamond-cut ceramic restoration is instantly created, just for you. Dr. Kellen Smith will bond this new custom-made restoration into place and any necessary adjustments are made for your comfort. And voila! Your CEREC restoration is now complete. One of the best things for you is that the whole CEREC process avoids the use of messy impressions, packing string around the gums, having to wear a temporary for 2 weeks, or having to return to be re-frozen to insert the permanent crown or inlay. Instead, the milling of the inlay/onlay/crown/veneer is completed in about 12 minutes and bonded into place that same day. 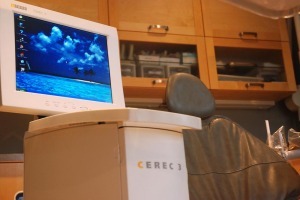 Call Us at (403) 261-8855 to book your CEREC Restoration appointment today!